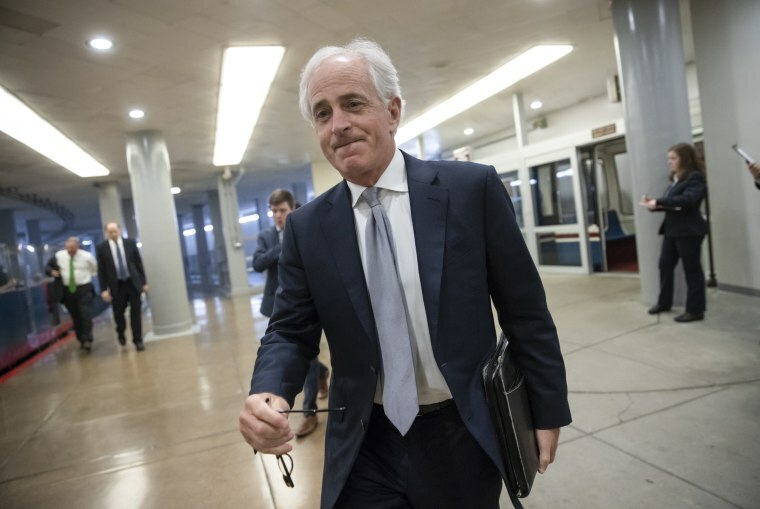 Corker's comments on Wednesday come the day after he lashed out at his Republican colleagues for blocking legislation that would have put checks on the president's ability to levy tariffs. Sen. Bob Corker, the Republican chairman of the Foreign Relations Committee, on Wednesday chided his GOP colleagues for being "cultish" and "fearful" under President Donald Trump, and said some are concerned about their prospects in the midterm elections. The Tennessee lawmaker said there are a number of reticent Republicans who are afraid to push back at Trump because they do not want to agitate the president. He added, "We have a lot of people who are willing to do the things that they feel are right for our country. We have some who are fearful of upsetting the president. But it’s not a good place for us to be." “A lot of them would vote for it," Corker said Tuesday of his GOP colleagues. "But no, no, no, 'gosh, we might poke the bear,' is the language I’ve been hearing in the hallways,” he said, mockingly. “ 'The president might get upset with us as United States senators.' "
Sen. Thom Tillis, R-N.C., said Wednesday that he is comfortable disagreeing with the president and that Corker was only frustrated that his amendment did not pass. "I think that's the words of somebody who's frustrated because he didn't get an amendment passed, but it's also the words of somebody who's got an extraordinary body of work on a bipartisan basis, so I get the frustration, but then we've got to move on," Tillis said. The president's eldest son, Donald Trump Jr., defended his father on Twitter and suggested that his supporters genuinely admired the president. "Not a cult at all," he said. "Maybe they just like someone who actually fights. Not just someone who talks about it then folds every time like they’ve seen for decades. Maybe they enjoy having a conservative at the helm who likes to actually win." Corker has been an outspoken critic of Trump. He notably squabbled with the president on Twitter last year, calling the White House "an adult daycare center." In his comments on Wednesday, Corker said his party has diverged from its traditional values, particularly on trade. He also blasted the Trump administration for its "ad hoc" approach to the issue. "It seems to me, especially on things like trade, that you know has been one of our central elements is fair, fair but free trade. And to have an administration that wakes up every day and at an ad hoc basis is just making stuff up as they go along with no coherency to it," said the Tennessee senator. He also said he thought a lot of the remarks from the president following his summit with North Korean leader Kim Jong Un was "hyperbole," but that he's glad the meeting took place and could lead to positive results. "I think it could be the beginning of us solving a problem that would be good for our country and good for the world, and I hope that can be the case," he said.